The chamber is panelled in oak with bolection mouldings (mouldings that project beyond the surface). It is decorated with cedarwood carving, and there is a semicircular (astragal) moulding along the entire cornice.Two doors are placed on each of the side walls (east and west). Before the room was removed to the Museum, there was a mullioned window of pinewood, with two pointed arches, in the north-west corner. This is recorded in a plan and watercolour of the room, both executed by Hanslip Fletcher (1874-1956) before the sale and demolition in 1903. The room was built between 1686 and 1688. Its moulding and carving are characteristic of English Baroque panelling and ornament of this date. It was built for John Penhallow for a house at 3 Clifford's Inn, Fleet Street, London. The overmantel is surmounted with the coat of arms of the Penhallow family with that of the Penwaring family. This records the marriage of an earlier John Penhallow and Mary, daughter and co-heiress of Vivian Penwaring, in about 1500.
overmantel on north wall, consisiting of frame surmounted by the arms of Penhallow quartering Penwaring, with festoons of fruit and flowers. 17th century Flemish landscape painting acquired for the Clifford's Inn Room in 1923. Shelf with projecting centre, and beneath it, architrave with two bands of ornaments, the outer floral and foliate with amorini in the corner, inner formed by acanthus leaves mitred round panel carved with festoon of drapery. Fluted marble lining for fireplace opening. Two doors on each of the side walls (east and west). Those nearest the chimney piece and surmounted with a broken pediment, with scrolls terminating in a rosette; the architrave formed by acanthus leaves, with corner brackets at the top; winged head of cherub, in high relief, immediately above the door. Those doors furtherest from chimney surmounted by lunettes, with scroll spandrells, and head of lion placed below the keystone. The architrave decorated with broad leaf and astragal mouldings. Richly carved foliate scolls in the panel immediately above the door and corner barckets at the top. Before the room was removed to the V & A, there was a mullioned window of pinewood, with two pointed arch in the North West corner. This is recorded in the plan and a watercolour of the room, both executed by by Hanslip Fletcher (1874 - 1956), before the sale and demolition. Window thought to have been inserted in the 19th century, making the panelling somewhat assymetrical. Window not included in the 1903 display. Bolection moulded panelling between the doors, windows and chimneys. Long upper panels separated from short lower ones by a bolection moulded dado rail. Two broad upper and lower panels sepate the doors, one broad and one narrow series of panels separate the pedimented doors from the wall with the fireplace. Astragal moulding along entire cornice. Two window openings along end wall, separated by assymetrical bolection panelling, (narrow left and broad central and right). Taken from 3 Clifford's Inn, Fleet Street, London before demolition in 1903.
on the old panelled room in the buildings of Cliffords Inn about to be pulled down. "It is a very good, and practically a perfect example of a well finished interior dating from about 1700 or rather earlier". He and others on staff recommend sanction be given for purchase. reports that photographs and drawings, owned by Fairbrother, Ellis & Co., are available to the Museum to assist with reconstruction. details the panellings and carvings from 3 Cliffords Inn from Messrs Durlacher Bros. For £606.7.6. An illustrated catalogue has been sent to the Art Library. reports on the arms upon the Cliffords Inn woodwork. Per Maclean's as being that of John Penhallow. reports on findings in the records of the Society. There is no record of the panelling but the occupier of the chamber was one John Penhallo. 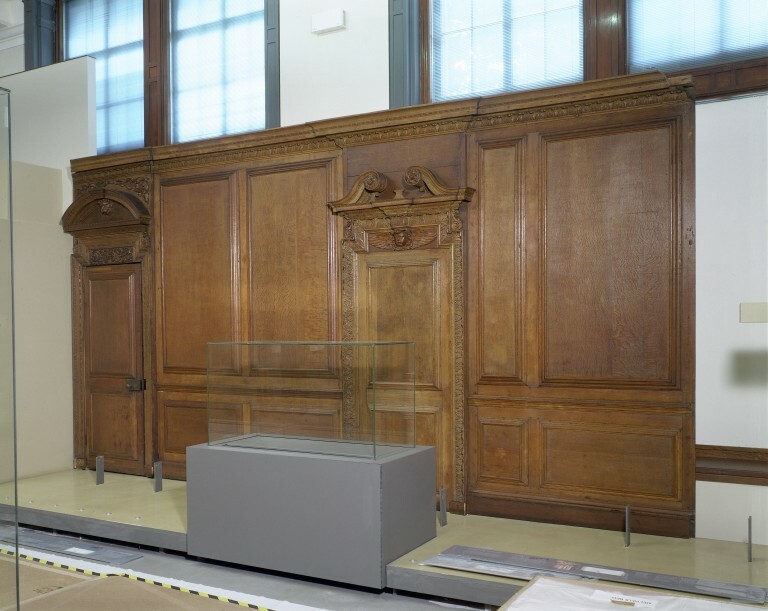 In 1688 Penhallo was admitted to the chamber in which the panelling was erected (after the building which housed his earlier chamber was torn down). 1688 records show: "in consideration of the interest which he had in his old chamber before it was rebuilt and also of the money which he hath laid in rebuilding the same chamber". Penhallo himself paid for the rebuilt chamber. He died in 1716 and his brother, Benjamin Penhallo, was then admitted. Benjamin died in 1722. Earliest records spell Penhallow with a "w"; it is omitted in later records. suggests that perhaps John and Benjamin Penhallow were brothers of Samuel Penhallow. He knows little of the descent from John Penhallow & Mary Penwain. Clifford's Inn, Fleet St, London was an Inn of Chancery, a college under the control of the Inner Temple. It consisted of a hall and chambers where students studied the Law from visiting lecturers before joining one of the Inns of Court. Its origins date back to 1310 when Robert de Clifford, fifth Baron Clifford was granted tenure of the suburban property by Edward II. Its most famous alumnus was Sir Edward Coke (d. 1634) whose great achievement was the foundation of English administrative law. After the civil war the Inns of Chancery declined as the system of legal education changed, and they became "little more than dining clubs", voluntary associations of lawyers presided over by an elected treasurer. 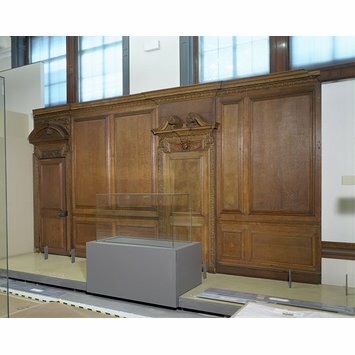 Fellows were admitted to a set of chambers for life, or sometimes for one or two lives beyond their own, leading to the furnishing of chambers in a proprietorial, and comfortable fashion, as in the Museum's Clifford's Inn room set up in 1686 (check) for John Penhallow, panelling from which is on display in the British Galleries. Dickens mentions Clifford's Inn several times in his works, evoking atmospheric legal nooks of the Inner Temple, by which time the Inns of Chancery were effectively defunct. Clifford's Inn was damaged and rebuilt after the Great fire in 1666, but largely demolished in 1934, and replaced by an office block. Clifford's Inn, Fleet St, was an Inn of Chancery, a college with hall and chambers where students studied the Law before joining one of the Inns of Court. The property was originally granted to Robert de Clifford, fifth Baron Clifford by Edward II in 1310. After the civil war the Inns of Chancery declined as the system of legal education changed, and they became "little more than dining clubs" for lawyers. Fellows were admitted to a set of chambers for life, which partly explains the high quality of the panelling from Clifford's Inn on display in the British Galleries. Dickens mentions Clifford's Inn several times in his works, evoking atmospheric legal nooks of the Inner Temple. Clifford's Inn was damaged and rebuilt after the Great fire in 1666, but largely demolished in 1934, and replaced by an office block. Herbert Cescinsky & Ernest Gribble: Early English Furniture & Woodwork. Vols. I (London, 1922), pp. 329-348.